Want Life to be terrific? Want wealth and health to come your way? Where there's ORDER, there's MONEY, -- a great philosopher told me. (It was Rosa, my ancient Mexican maid who kind of spat at me contemptuously when she said it.) Do as I did in the wake of meeting ROSA. Vow now to clean up the house. And vow it every morn, after coffee, and clean for an hour while the first flush of caffeine is fresh. If you simply can’t, get the Mexican Newspaper and hire a servant. HOW TO TRAIN A SERVANT. 100$ a day three times a week, 1200$ a month, you help a poor family and go broke yourself. 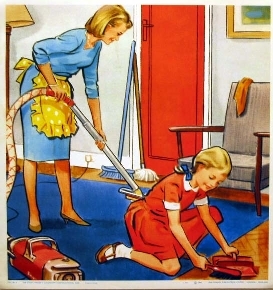 Maybe you can learn to clean a house fast and do it yourself. Take that 14,000$ a year and buy income real estate. To inspire you to start this labor of getting rich and spiffy, go outside, cut branches from trees, flowers if you find any, bring potted plants inside in baskets, with a plate set inside so you won't stain furniture. Fill the vases, mayo jars whatever. I particularly like ENGLISH IVY. It grows in abundance and has as much pizzazz as flowers. Only use the young tips, the last foot or so.When you finish, you know those spray perfumes people give you that you hate? They make good lightbulb spray. The way your house feels when thusly loaded with branches, leaves or blossoms will inspire you to brake for garage sales and pick up old vases for a quarter. VERY IMPORTANT for good home decor, or feng shui is lots of flowers and plants in the house. BUT BEFORE you load up your home with vases with living stuff .......the most important thing is to DE CLUTTER. To do that, get everyting cluttering your ROOM into another room. Go thru it with 3 plastic tubs or CONTAINERS or maybe new plastic trash barrels that you can use later, not just for this 2 day declutter effort. The trick is to EMPTY the messy room into another room, then sort. PURGE the expert calls it. Three labels on 3 tubs saying "Toss", Gift or Keep. Go thru all clutter. As we paid so much for this clutter, the fourth tub should read "GARAGE SALE" or EBAY"
That's the DE CLUTTER method I learned on HELLEN BUTTIGIEG's SHOW 'neat' on ION TV. Regular people with clutter, not psychopathic hoarders. That last show I can't WATCH! The three tubs method will work for you. But watch her show, for the other tips. She's a genius. Chirpy as a sparrow, Tough as a concentration camp guard. HOME-SPIFF Organization 101–NEVER MAKE A BED IN THE MORNING! EVER unless you intend removing all sheets to launder them! In Europe they air wash them, hanging sheets off windows, balconies. It isn’t just a fear of bedbugs. Sleeping all night in a bed makes it moist. Even though you cannot feel it with hand, it is saturated! You want that wetness of our sweat to evaporate! Never seal a’hot’ bed. Wait at least til after lunch to make the beds! So promise yourself to tell the family about this new, important habit. First thing in the morning, open all the beds to air them out. If you have some good cord, string it from window outside to a tree, hang some sheets to air. Beds can be made late in the day by MOM, before the family comes home or by the kids when they return from school. Get a bottle of febreze and snark a little lightly before the new bed is put back together. Another source --Julie Morgenstern -- the New York author of Organizing From the Inside Out and time Management From the Inside Out, recommends a three step approach to getting the most out of the space in your home: analyze, strategize and attack. Analyze. Decide what three to five functions are normally done in the space. Ask everyone what's really essential in the room, and what works and doesn't work about the space. For instance, in LIVING ROOM, nobody Watches tv. So let’s forget about TV GUIDE being in there. Or snack tables. Nobody reads. GOODBYE magazines! Put all that in the DEN. Attack. Only after you have a plan should you start to do the work. Making SPACE - Now, says Morgenstern, it is time to work out your SPACE - meaning to Sort, Purge, Assign, Containerize and Equalize. pencils rally have a reason to be in the reading corner. place every time so everyone knows where they are- and where they go. easily put away in about five minutes during clean-up time. might mean buying a few extras of things you already have in your house. change as they get older. act, it should be easy. It's easy to clean a house. 1.) Take a big box, walk around picking up all objects that look 'extra.' Later you'll know where to find them. Outside on table in sun. 2.) You throw in a load of laundry at a time. 3.) Vacuum and sweep the same areas, alternately. Dustpans, brooms great inventions. Prob don’t need vacuum! Make a homemade carpet stain remover - just never mix ammonia and bleach. You can do a degreaser detergent tbp to a gallon of water, add some ammonia, rinse with gallon of water and 1/4 cup vinegar. 4.) Turn on radio and listen to talk shows while you scrub spots on carpet or wash dishes. It keeps you from hating doing carpet spots and dishes. 5.) Don't bother making beds. Open them fully. Wide open. Leave them to breathe all day and exhale your aroma and dampness. Let them breathe themselves fresh. Lock bedroom door or the dog may add a new aroma.. Who looks at a bedroom anyway. EXPERTS tell us this kills the moisture that leads to mold in our pillows, mattresses and bedding. In Europe, they hang all bedding out on the line in sun! Read up on MOLD by googling house + mold + eradicate. 6.) Take a broom, drape with rag, clean cobwebs above, in ceiling corners. Hang rag in sun til 30 rags to wash in one load. 7. A. Pour old dishwater on kitchen floor, broom it out the backdoor. Then use the rag to rumba across floor 'til it's dry. B: Create a free do-it-yourself Swiffer made of an old, square sponge mop, which becomes change-it-ten-times-or-l00 times - YOUR SWIFFER is BETTER THAN THEIRS! Click and see why. Your MICKEY MOUSED SWIFFER will become mighty, helped by your extensive absorbent cotton rag collection and THIS BREW, SEVERAL SLUGS of vinegar, water a tbsp of detergent. With that sauce you clean better than the fifty buck swiffer and l00 laundries of costly swiffer heads. I save big rubber band from broccoli, quadruple fold my rag, an old towel, rubberband it on the head, when I finish, rinse towel, hang in SUN TO DRY. When I have 20 rags, half rinsed and DRY I run laundry. AGAIN, LINE DRY THEM. hen. 8.) Fill every vase in the house with flowers, branches. Leaves. Sheaves of wild grass plucked in alleys on way to market. In water, tsp chlor, or lemon juice, 1/2 tsp sugar. 9.) Clean all sinks, drainboards with bleach, ammonia(never both at same time,) as MOLD must be eradicated. VODKA-CLEAN toothbrushes, BLEACH (DILUTED) clean toilet bowl, seat and base. Then, Spray entire house with anything aromatic. Febreze fabric spray, cologne, incense. Room fresheners. And my fave, GIFTED COLOGNE that I wouldn't put on my SELF on a bet. 10) Dust-rag all shelves, books. Wax furniture with old, rancid handcreams. 11) On hands and knees, de-spot carpet with a heavy grade brush. Detergent/water/ammonia. Then use a rag to scrub up the water and soil. Every six months, during hot, dry weather, use a rented, 19$ 24 hour hot water shampooer with your own HOME MADE mix of shampoom same recipe as above. Give instructions to all house mates it’s coming so EVERY SINGLE THING, chairs, etc, is up on unmovable objects like beds. 12.) GET TO THE DIRTIEST SPOTS in the house, where GERMS collect. CLEANING AREA RUGS, INVENTIVE TIPS. Clean with cheap stuff: ammonia, dish soap, (detergent liquids), vinegar, hydrogen peroxide,cheap vodka, wax with old rancid face creams and body creams not costly cleaners and waxes. A great website, Pennysolutions Site tells you how to make your own. 99c for a bottle of dawn at super or 99c store, goes in a week? Our Mexican super market chain VALLARTA had mex soap detergent powder, 15 lbs for $5.99 as a big bag. I put it in a big bucket with a tight lid, plastic scoop inside. Now use a tad for dishes w. very hot water to dissolve. I figure by next year I'll have to buy some more, but that was a ton of DAWN and TIDE I didn't have to buy! And get the big bottle Vinegar as it Kills Bacteria, Mold and Germs Adapted from the "Care2 Ask Annie" newsletter.And it’s great as softener for last rinse of laundry. 1/3 cup is enuf. Vinegar is a mainstay of the old folk recipes for cleaning, and with good reason. The thing about vinegar is that it kills bacteria, mold, and germs. Heinz company spokesperson Michael Mullen references numerous studies to show that a straight 5 percent solution of vinegar - such as you can buy in the supermarket - kills 99 percent of bacteria, 82 percent of mold, and 80 percent of germs (viruses). He noted that Heinz can't claim on their packaging that vinegar is a disinfectant since the company has not registered it as a pesticide with the Environmental Protection Agency (EPA). However, it seems to be common knowledge in the industry that vinegar is powerfully antibacterial. Even the CBS news show 48 Hours had a special last December with Heloise reporting on tests from The Good Housekeeping Institute that showed this. Keep a clean spray bottle filled with straight (5 percent) vinegar in your kitchen near your cutting board, and in your bathroom, and use them for cleaning. I often spray the vinegar on our cutting board before going to bed at night, and don't even rinse, but let it set overnight. The smell of vinegar dissipates within a few hours. Straight vinegar is also great for cleaning the toilet rim. Just spray it on and wipe off. Below is a list of OTHER homemade cleaners...just for FYI! A bit cheaper than buying... so there’s money left for the important stuff: Garage sales and new furniture. NEW TO YOU! In a plastic jug, mix: 1/2; c. ammonia, 2 Tbsp baking soda, 1/3 c. white vinegar, water to fill jug. Save your old jugs. They abound in trashcans. Rubbing alcohol and ammonia. This is a favorite. Spray it on and use a soft vegetable brush to brush the sinks, then rinse. Mix 3 c water & stir in 2 Tbsps ethylene glycol (antifreeze). Put in spray bottle. Household ammonia, washing soda, white vinegar, 1 gal warm water. Measure ammonia, washing soda, and vinegar into water in a bucket. Mix. Store in clean bottle. 1 cup isopropyl alcohol, 1 cup ammonia, 1 Tbsp. soft soap, 13 cups warm water. ANOTHER GLASS CLEANER. If you find an old bottle of windshield wiper solution in somebody's garage, discarded, put it in a spray bottle for glass cleaning. Mix 4 c sodium bicarbonate & 3/4; c caustic soda. Store in airtight can/jar. To use, sprinkle in toilet bowl, let stand 1/2; hr. Then brush and flush with clean water. Dissolve soap flakes & borax in boiling water by stirring mixture. Allow to cool to room temp. Add whiting & stir well. Store in sealed plastic or glass container in dry, cool place. Mix in a jar, 1 cup borax and 1/2; c. baking soda. Add I Tbsp of this mixture to the dishwasher soap for each load. QUESTION: What can one do with those little slivers of melted soap that are saved? You know, Used soap, all kinds ---from all stores too. For handmade soaps, one can put the soap in a crock pot with a little milk and rebatch it and pour it into molds with some Essential oils.Another form of recycling for soap bits and pieces is make scrub sacks with them. Into a piece [nice big square say 5x5] of cheesecloth I lay my scraps, add a very generous handful [maybe 2 handfuls, I have small hands] of oatmeal [regular not quick oats] then a tablespoon or so of lavender or chamomile flowers. Gather the ends and tie off. That oatmeal feels divine. You can recycle your cheesecloth for later scrub sacks too. Rebatching may not work with corporate soaps, because those are petroleum product based. However, scraps of homemade soaps can DEFINITELY be rebatched this way. Use 9 oz of cold milk to 24-32 oz of grated soap. yes, you should grate those slivers, or at least, break them into smaller pieces before attempting to melt them. Use leftover juice cans or tuna/cat food type cans to remold the soap in. Always allow rebatched soap to dry for three weeks before using it, or the soap will just dissolve in the shower. Those shampooing machines do pull a lot of water from the floor, but if you have nice wood floors and own the property don't do it. This is the revenge-on-the landlords invention of all time. Landlords should make you sign a lease saying you won't ever use them. If you own the house, at least do this wood warping torture when it's exceedingly dry outside. Dry and hot. Do huge 8 x 10 area rugs outdoors. I either lay it on the cement driveway soaking wet. I like the slope of hte driveway for draining. Or I hang it on the fence. How to get the dirt out? Ingeniousness to the rescue. I took a one by four scrap piece of board, a lumber piece a foot long, wrapped it in heavy plastic, like for green house walls, 6 mil? so it was slidey. Then when I got on knees, it slid over the surface of the carpet, squeegee-ing the water in its path, out of the carpet. As I didn't have a deck, I used a concrete driveway that had a slanted pitch, down to the street. On hands and knees, I squee-jeed and water ran down the carpet to the street. Many times, hosed it, soaped it, squeegeed it. Let it dry on the slant. Dirt and water were squeezed/ drained out, down to the street. Didn’t drive car up the driveway, that's for sure. Parked it in street for a day. My driveway gate was ten feet wide, wrought iron, so for medium carpets, I'd lay carpet over the top of gate, hose it, couldn't squeejee very well there, just hose and soap action. SPIFF THE HOUSE UP. Buy really awful, amateur night in Dixie stretched canvases/ paintings at garage sales. If the art is awful enough, the Thrift Store will be in agreement with you it's worth nothing, they should pay you to take it away. Don't tell them that you’re going to use a canvas which even at the cheapest art store, is very costly. Next, buy some oil or acrylic paints and paint portraits and landscapes and then re use the frames you bought them in. Remember this. IF the paint is OIL already, you cannot cover it with acrylics. If the paint is acylics, you CAN cover it with oil. A FINAL CAVEAT, DO NOT DRY CLEAN CLOTHING OR USE TOXIC CHEMICALS IN A ROOM THAT IS INHABITED OR CANNOT BE AIRED 24/7 If you use the superb de-greaser TSP, wear a MASK. VENTILATE KITCHEN WELL. Don't use moth balls unless you have a super good seal on that box, closet or bag. MOTHBALLS are toxic! ROSEMARY goes in bag with WOOLS. LEARN WHICH FUMES ARE TOXIC. PICK UP OLD FURNITURE in ALLEYS, THEN, hit the garage sales. Look AGAIN for overstuffed furniture you can cover with fresh cottons. And yardage. Sheets work. Buy a stack of printed cheap sheets, poly not cotton.....the thing is the PRINT. Make it one you love. Whip stitch them into a coverlet tailored to the chair. Turn outside in and throw on 'til your ship comes in and you can afford reupholstering. I've had a roll of upholstery cotton, half way like canvas, 20 yards, standing up in garage for 18 years. I forgot to bring SEWING MACHINE into the house when I moved in back in 1999. EXTERIOR OF HOUSE looks like Afghanistan? Walk perimeter of bldg. FIX ALL BROKEN CORNERS OF THE HOUSE WITH CHEAP HOME MADE CEMENT . Use Cheap cement. Sounds neat, but how do we do that? Saw this in a chatroom. "I am curious as to how the newly laid block will hold up to the elements if it takes a few days to construct, seal, and roof the building. If I were doing this, it would be over several weekends, and I'm wondering if I could safely leave the partial walls etc.?? Maybe after your experimental brick has cured you can check its water resistance in that state, I'd try a batch myself, but my wife doesn't let me near her kitchen stuff. ANSWER: go to a Home Depot, Lowes, Builder’s Square or similar building supply house, go back in the section which has pails of bedding mud for drywall joints, mortar mix etc. and look at the various tools. Among them will generally be two brands of mixers for insertion in a half-inch drill for mixing small quantities of mortar and paint. Buy one. It’s generally cheaper than a divorce. Making and testing samples is always advisable before plunging ahead. This stuff works fine. It was the subject of an article in Countryside four or five years back for someone who built himself a quickie, small dome, and Jack Bays (don’t know if he is still alive), an eccentric in Cedaredge, Colorado, used to sell a king-size malted-milk mixer you dropped in a fifty-five gallon barrel to mix this and other good stuff of his devising. Since it was then more available and of even less value (stores paid you to haul it off), he used pulped cardboard boxes, in which the fibers are a little stronger than those in paper. There have been some recent developments along these lines, and one patent Tridex which used junk materials like this to make an extremely strong building panel with good insulation characteristics. THIS JUST IN, Tip from my holistic Expert: If you find VODKA in the trash, TAKE IT HOME!. VODKA IS MAGIC. This germicidal stuff is used by a cosmetician gal who has gone to every holistic classroom, bought every book on holism..She says "IF you stumble upon a bottle of vodka or gin in an alley, in the hands of a sleeping or comatose bum, tilt it so you can see the label. If it is 100% proof, yank it from his grip, run home & use it for cleaning. Only l00 works, not 80 proof. It is used by acupuncturists prior to needling. I use it for toilet seats, faucets, silver ware that doesn't go in dishwa...on the fly. etc. instant germ proofing/cell phones, house phones, tooth brush soaking, (rinse first before using), great for cleaning glass, glasses, clean steering wheel muck, under fingernails, toenails, shower head, fixtures, ...endless uses. I get a lot of razzing for those jugs under my sink! and more so when I stand in line w/the jugs in my cart....haha the truckers say, "Yeah, sure lady!" so funny. The alcohol in the vodka kills mold and mildew. the skin and tighten pores. and freeze for a slushy, refreshable ice pack for aches, pain or black eyes. THANK YOU ANITA SANDS! I love the free seminar, especially the CLEAN course! Could I see the others? When HOUSE is CLEAN, read the EzBreezy Method for the no-work-GARDEN.